New Pricing Structure: I have been trying to find a way to add value to the smaller orders. So starting February 1st, most of our items that we stock will be marked down at least 10%. So no more need to spend $100 at a time and no more coupon code for the discount. 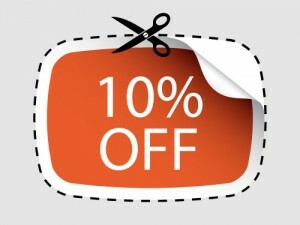 The 10% will show up in the form of a sale price. Very few items will be exempt and if I receive positive feedback, I plan on leaving this discount in place permanently. I still plan on running monthly sales that are in addition to the 10% already marked down price. The Triad Area ASL Club: We will be firing up the engines after a lengthy hiatus. The last time we met was before the Albany Tournament so much killing is overdue. At that rate, this war will never end. 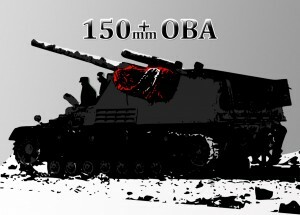 We are also getting ready for our very own ‘Where the Iron Crosses Grow’ tournament which is just about 2 months away. Most of the spots are filled now but please let me know if you wish to attend and I will try to accommodate. In an effort to get more SK players to join the ranks of full ASL and more full ASL players to attack some new frontiers, I would like to make some short videos to show examples of rules and rules sections. Please take part in the survey below and I will do my best to teach some of you something new and give those of you who know the rules better than I do something to correct/add to. Which rules section would you like to see explained in a video? None, because I've played Derek before and know just how little he really knows about the rules. Sniper/ELR Cards: I am finally caught up on all of my woodworking projects so it is time to finish up the Sniper/ELR cards. I should have them up on pre-order soon. 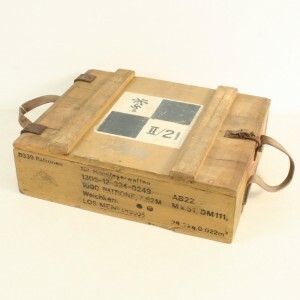 Winter Offensive 2016 AAR, Dice on their way, PIF Update. 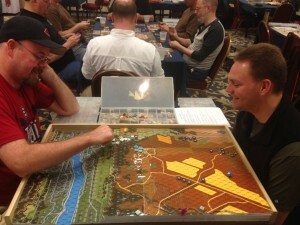 Bret and Ed Jr. playing in the Dinant mini championship on Dan’s 3D map. Thursday: Against the advice of my wife and the weatherman, Ray Woloszyn and I left Kernersville at noon for Bowie MD. We arrived at the hotel around 6:30 and it was actually quite full with players but there was definitely more table space than usual and a lot less sharing tables going on. First I head to the table to check in and I and all the other registered players are given a free copy of J11. I also bought the new W.0. scenario pack. Thursday evening: I picked up a game with Steven Kyle. I had never met Steven before but sure am glad that I did. We laughed more than we rolled. I played as the Japanese who I really enjoy because of the little tricks I can use as the defender. The tunnels are probably what saved me as I infiltrated back into his newly won bunker to ambush his unit. A pretty nasty trick as you can advance concealed against his unit in the bunker for a -5 on the ambush roll. I had a fantastic time playing him and chatting with him over the next 3 days. My initial set-up. Tunnels not shown. Friday morning: I had made arrangements to play Dan Dolan on his upcoming Dinant module. I took over on turn 2 from Doctor Rob as the defending French. This is one of the most beautiful maps I have ever seen. I am sure this will be a top seller and a collector’s item (and possibly give the nudge to MMP to get the CdG reprint rolling). Stephanne from France took over for me on turn 4. I am not sure how this scenario ended but Stephanne and Dan were still going at it 36 hours later. Friday Afternoon: I started my day with a game against Warren. I have never played or met him before either and we decided to play ‘Into Vienna Woods (AP52)’. This was going to be the one game every year that has the crazy ending story. In my last turn, Warren is in firm control with a 9-1, 3 x 4-5-8’s in the foxhole he needs for the win. A NMC later, all but the leader is broken leaving the hex empty for me to advance into the foxhole with a 9-1, MMG, 6-5-8, 3-4-8, and a hero. In his last prep fire phase, a 1MC breaks the leader and the squads leaving me with nothing more than a hero to defend with. The 4-5-8’s rush the hill and all break to the hero’s fire except for one squad that advance in. My hero fails his CC attack so it is for Warren to roll a 8 or less (a 9 would possibly win also depending on the subsequent wound severity roll). The poor Russians forgot to bring shovels and bayonets with a 12 on the final roll of the game. The German hero holds the position for the win. Friday night: John Dober is one of my favorite people in the ASL community so I always make sure to find a way to get a game in with him. He picked an old classic ‘The Crux of Calais’. I moved my German tanks down the left flank of the canal. The bridge on the far left across the canal is blown so I figure that the flank will be sparsely defended. This will allow me to get my tanks in position to hurl smoke at the next bridge to insure a safe voyage across the water. Well I was wrong. 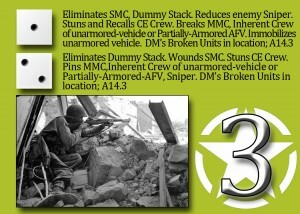 Three hits from his AT gun and one from an ATR leave me with 3 less tanks and one immobilized. Looking very bleak. I manage to cross the bridge with a few squad and surround a large group in his main defensive building with my remaining tanks. A HMG and MMG on L2 across the water threatens to interdict any of his units from the right side that will try to reinforce the battle, so John calls it quits probably more to get a good night’s sleep than anything else. Saturday Morning: I get a chance to meet and play the legend ‘Jim Stahler’. We chose AP112 First Ally. His Poles cleaned my clock. I managed to do nothing more than break a couple of his squads. I didn’t enjoy playing the Slovakians with their 3 FP firing into stone buildings. It will take a better player than me to figure out how to use them properly. The real enjoyment was the company I shared. 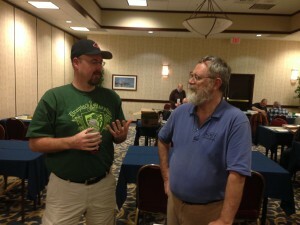 After talking about the old days of Avalon Hill and the designing of Breakout Normandy and others, we had lunch together where I found out that we both have a love for Irish music and we both play the tin whistle (I carry one in my car and he carries one in his pocket). I told him that next year I would bring a guitar or a mandolin and we would get together to play a tune or two. Saturday afternoon: Ron and I sit down to another new scenario J167 ‘Hart Attack’. This scenario is set in the hills and olive groves of Tunisia. I made a mistake (as I often do) and misread the olive grove rules believing that a tank in olive groves are hull down. I found out the next day from Ray that this isn’t the case. The untimely demise of his 9-2 and 2 less Grants including one falling to an underbelly hit from a tungsten shell and victory was out of reach for Ron. Saturday Evening: “Wild Bill” Hayward, of ASLOK fame is my next opponent. I have never played against him before as his night shift at Oktoberfest is way past my bedtime but we have spent many hours talking and am grateful that we finally get to face off against each other. Just the three of us; Me, Bill, and a loaf of bread. We played J173 ‘Assault on Baerendorf’. I was happy to get to play the Americans in this one. With 5 Shermans and oodles of elite squads I managed to almost blow the game in the first turn. As master players often do, Bill predicted my avenue of approach and was staring at the rear of all five of my tanks with his HIP JgPzIV(L). Boom goes the first one, but then things get worse… I roll his SAN and it drifts to my 9-1 stacked with three squads (yes, I should know better). For random selection I roll 5-5-5-5 (3 x SAN in the bank). He choses the leader so now I have 3 x 1MC where I roll 4-4-4 which would be great if his SAN wasn’t a 4! So now he has six SAN rolls. Although he misses on all six, by turn three he was up to 14 sniper checks with another kill on my 8-1 and a wound on my 8-0. Somehow I manage to pull it off on the last turn for the win. Sunday Morning: I got a chance to play a brand new friend named Peter Ortega. If any of you get a chance to meet or play him, you will not be disappointed. He is a prime example of some of the best people in this hobby. 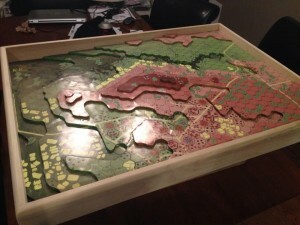 Polite, interested in learning, and willing to share stories outside of the world of wargaming. We played ‘Brief Breakfast’ from ‘Out of the Attic’. Peter told me tat he plays almost exclusively with his cousin so this was a great opportunity to learn some new tactics. We were having so much fun that we were going to play a second scenario but a snow emergency called him home. I expect to see him at ‘Where the Iron Crosses Grow’ in April. Sunday Evening: Tom Arnold and I played AP59 ‘Taking Heads’. 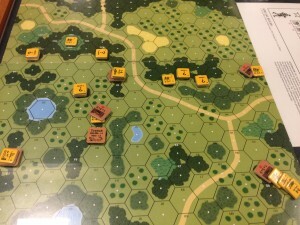 Tom had very little experience playing PTO but it didn’t show as his elite squads banzai’d across the Kunai fields to engage my .50 cal toting Philippine Army. I tried for two turns to slow him down with fire lanes but those 4-4-8’s are tough opponents and most made it into my positions to engage in HTH combat. A slow withdrawal and back to the village before Steve (from game 1) took over from Tom to finish the game. The IJA as is so often the case, lost momentum with all the striping in the waning turns of the game and were unable enough to wrestle enough VP’s from the good guys. This ended up being my final game for the great weekend. Special mention goes out to Perry and the Youse’s who never flinched in the face of the storm. Ken Knot who gave as good as he got we traded insults for 4 days. The Hotel for not running out of food or patience. The attendees for showing up and making it 4 days to remember. I will see you all next year. In the future I promise to take more notes and photos. It has been one heck of a flying start to the new year. Beyond Valor is back in print, Journal 11 has been put on pre-order, Poland in Flames is days away, Yanks is right behind, Korea is on pre-order. Time to get a second job I guess. Winter Offensive is only four days away. I wasn’t planning on going this year but alas I have a map table and three 3D maps that need to be delivered so I am happy to have changed my mind. Please find me and introduce yourself if you are going as I would love to put faces to the names and get some games in with some of my readers. Unfortunately Ulrich will not be coming with me this year as Maria thinks that 9 days out of school for ASLOK was enough. 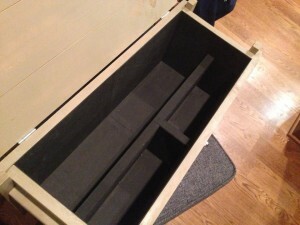 The final project on my list was finished last night. 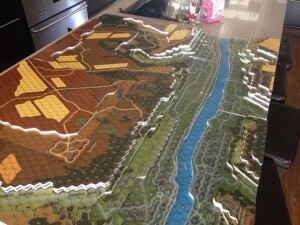 The Kakazu Ridge 3D map for Dan Dolan turned out better that I had imagined. I hope he likes it and will allow me to get a scenario in on it at WO before he hauls it home. I have made a ‘how to make a 3D Map Page‘ for any of you that are interested in making your own 3D maps. I tried to make a video but the audio did not come out (I forgot to remove the gopro from it’s waterproof protective case). I may post the video anyway as you can turn the volume way up and hear a little bit. Now it is time to play some ASL as I take a long overdue break from all my projects (except Tim’s Dice Tower). 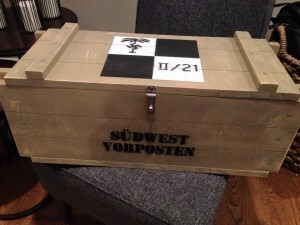 These are the photos of the finished Map case for Eric Ortega at the Southwest Outpost. It too turned out better that I thought. I aged it a bit as it was a little too pristine to have the right combat look. 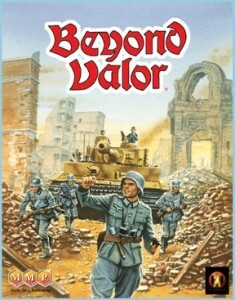 We have Beyond Valor in stock with free shipping and 10% off your entire order coupon code ‘10%off’. 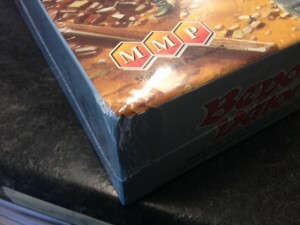 I have one copy of Beyond Valor that has a small crease in the box that I have marked down another 10%. I am happy to hear from so many of you that are buying BV for the first time after playing Starter Kit. Welcome to major league, just watch out the hordes of screaming women throwing themselves at you. It takes a little getting used to. We had our 20,000th visit today. Considering we have only been up for 2 months, I am very happy with these numbers. Thanks to all of you for making this happen. None- I can’t buy a game lately. Where is everyone?!? 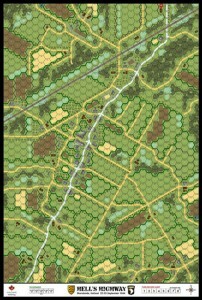 Well after 30+ hours, the 3D Dinant map for the upcoming ASL Campaign Game covering Rommel’s famous crossing of the Meuse is complete. I will be delivering it to Dan Dolan at Winter Offensive on the 21st of January. If you are attending the convention, be sure to check it out or check with Dan to see if he’ll let you take it for a test drive. Speaking of 3D maps, I am making another Kakazu Ridge 3d map also for Dan and have been filming the complete process with my Go-Pro. I will be posting the how-to video on Youtube and on this site for those that are interested. I spoke with Luanne this morning and she told me that Yanks will NOT be ready for W.O. Also remember that YANKS can be ordered for the MMP pre-order price right here on our website with free shipping so you can save $10-$15. Although all three copies of the Pre-Order special that comes with free Polish Battle Dice are sold, Chris is sending me more dice so I will extend the offer for up to another 2 copies of PIF if ordered before the end of this week. 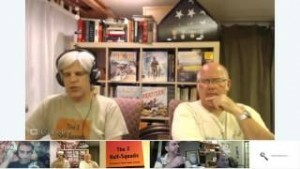 Ritterkrieg is now the official sponsor of The 2 Half Squads ASL podcast. If you are not familiar with Jeff and Dave, please check them out. They have almost 200 episodes that span hundreds of hours of ASL talk, comedy, rules, AAR’s, reviews, special guests from the world of ASL, etc. They make the long drives to conventions fly by painlessly. BFP: Crucible of Steel and Operation Cobra. MMP: ASL Map Bundle (SK Style), Annual ’92, Annual ’93 , Action Pack 5, and Action Pack 6. Lone Canuck Publishing: Bloody Buron & . I hope everyone had a great holiday and got to spend time with loved ones. It looks like this is going to be a giant year for ASL with many reprints and new items hitting the market. 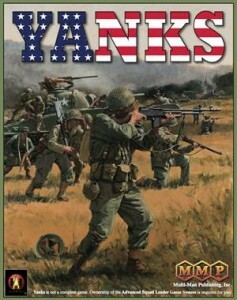 Is it possible that Beyond Valor, Yanks, Rising Sun, and For King and Country will all be available at the same time? According to Luanne, For King and Country is only a few months out so you don’t have to despair or pay extortion e-bay prices thinking that it will be years before it is in stock again. 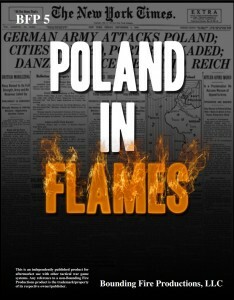 The next run of Poland in Flames that will be going out to the retailers is only days away with the last of the counters in queue right behind BV. 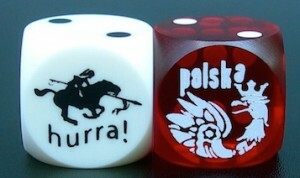 We have sold all three pre-orders that come with the free Polish Battledice. I am working together with Chris Edwards to see if it is feasible to bring his awesome AFV/Vehicle PDF files to print. We are not sure if these would be released as one massive set or if they would be released in nationality packs. We will keep you posted. December’s raffle winner is David Elmore. This months prize is a one of a kind custom coffee mug from the talented hands of Tim Brieaddy at Red Headed T-shirts. If you didn’t win, no biggie as you have a whole year of entries from the time of your last purchase. 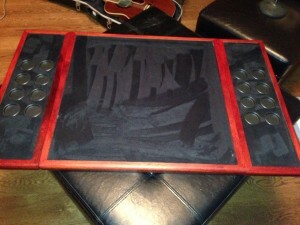 The PzIIIJ Tabletop that was shown almost complete is now finished and sold to a local ASL player from Cary, NC. I hope it witnesses many laughs, close games and a few beer stains. I am getting close to being sold out on the OBA cards. Alex Key may still have some in the US, Chris may have a couple in Canada, and Xavier may still have a few left in Europe. After that…they’re gone. There will not be a reprint made as I think we are very close to the saturation point of interest. 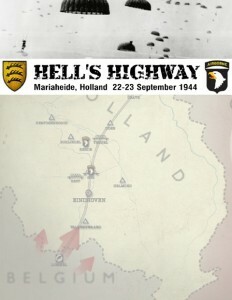 Ian Tuten and I started a campaign game of Hell’s Highway last week. Ian wanted the Allies and I was happy to take the Germans with their plethora of Panthers and Assault Engineers. Neither of us knew anything about the battle before now and were pleasantly surprised at the somewhat unique situation of a very strong Panzer unit overwhelming the small Dutch town of Mariaheide only to be relentlessly attacked from two opposite directions by British armor and US Paras, while never-ending swarms of Jabo’s hunt from above. We ended up finishing the first scenario of the campaign and calling it quits as the US Paratroops were a little too aggressive and got cut off and destroyed just to the South of the town. I am looking forward to trying this one again.